• Over the past years, in cooperation with the National Széchényi Library, OSA started the processing and digitization of the extremely important Héderváry Collection to facilitate research. The collection, currently kept in the Manuscript Department of the National Széchényi Library, was donated to the institution by Claire de Hedervary in 1999. The backbone of the collection is a set of several thousand documents on the work of the UN Special Committee, which, supplemented with related archival material and contemporary press coverage will be available on OSA's website from the end of October. • The most upsetting set of documents of the Special Committee consists of 111 witness testimonies, given by Hungarian émigrés in the spring 1957 on the invitation of the Special Committee. Audio recordings of 65 of the testimonies were found, too, excerpts of which are available on-line on OSA's website. Over the next month, with the help of the media, we wish to find as many living witnesses (or their family members) as possible, and invite them to our October event. • The detailed program of the October 22 event will be advertised here from mid-October. By adopting Resolution 1132/XI. on January 10, 1957, the United Nations General Assembly established the Special Committee on the Problem of Hungary for the purpose of investigating Hungary’s 1956 Revolution, the subsequent Soviet military intervention and the circumstances and events that led to the installation of a counter-revolutionary government under János Kádár. Five countries were asked to delegate members to the Committee. Australia was represented its Ambassador to The Philippines, K.C.O. Shann, Denmark named Alsing Andersen, an MP, while Ceylon, Tunisia and Uruguay delegated their permanent UN Representatives, R.S.S Gunewardene, Mongi Slim, and Enrique Rodriguez Fabregat, respectively. Since there were five members in the Committee, commentators sometimes referred to it as the Committee of Five. At its first session on January 17, 1957 the Committee elected Alsing Andersen as Chairman, and K.C.O. Shann as Rapporteur. UN Secretary-General Dag Hammarskjöld appointed William M. Jordan, then head of the UN Department dealing with political and Security Council matters, as principal secretary of the Committee – i.e. its operational chief – while naming the Danish diplomat Povl Bang-Jensen as Deputy Secretary. (In 1959 Bang-Jensen committed suicide under suspicious circumstances.) Claire de Héderváry became an advisor and chief assistant to the Committee, who coordinated its operations and also took part in the compilation of the Committee's Report. 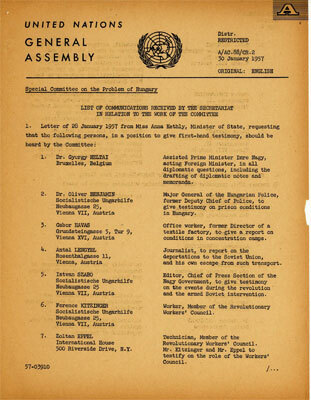 Through its Resolution, the General Assembly charged the Committee with the task of “providing the Assembly and all the Members of the United Nations with the fullest and best available information regarding the situation created by the intervention of the Union of Soviet Socialist Republics, through its use of armed force and other means, in the internal affairs of Hungary, as well as regarding developments relating to the recommendations of the Assembly on this subject…”. Furthermore, the Resolution called upon the Soviet Union and Hungary to cooperate with the Committee in every area and, most notably, to guarantee members and officials of the Committee entrance and freedom of movement in the country. At the same time, the Resolution asked every Member State to pass on to the Committee all information relating to the subject of the inquiry, including information, eye-witness accounts and crucial evidence obtained through diplomatic channels, as well as to cooperate in obtaining such evidence. The Resolution about the establishment of a Special Committee was not the first instance of the “Hungarian problem” appearing on the UN General Assembly’s agenda. At the joint request of the United States, France and Great Britain, the UN Security Council had already been called into session for a discussion of the Hungarian situation on October 28, 1956, while the Revolution was still going on. As the Soviet Union had power of veto in that body, there was not much chance of coming to a decision there. To make things worse, the Hungarian government under Imre Nagy made the claim that the events taking place after October 22 fell under the country’s sovereign jurisdiction and for that reason it strongly protested against any discussions about Hungary’s internal affairs in the world organization. This statement, prompted by strong pressure from the Soviet Union, was also written in the hope that it might dispel the suspicions of the Soviet leadership and pave the way for a peaceful solution to the dire situation that had developed after the first Soviet intervention. However, in the early days of November this statement was not the only obstacle to the proper handling of the Hungarian problem within the world organization: another current development was the eruption of the Suez crisis, in which Great Britain and France were directly involved. As a result, the UN and the western powers failed to respond to either the Hungarian government’s November 1 declaration of neutrality or its subsequent plea to start substantive negotiations about the Hungarian situation. But the prime reason behind the western powers’ passive stance was the realization that they possessed neither the political nor the military means to stop the Soviets. Therefore, they stood by idly as the Soviet Army launched a full-scale attack on Budapest. The second Soviet intervention on November 4, as well as crushing the Revolution and toppling the legitimate Hungarian government, created a new situation in the UN. At the request of the United States and other member states, the UN General Assembly added the Soviet intervention in Hungary to its agenda on the very day the invasion took place. The Soviets had the means to prevent a Security Council resolution condemning the intervention, but they had no power of veto in the question of referring the issue to an extraordinary General Assembly session. In the first weeks of November the General Assembly produced a number of resolutions with a majority vote, calling on the Soviet government to desist from any military action against the Hungarian population, to withdraw its troops and to restore the Hungarian people’s right to self-determination. The resolutions also called for free elections to be held, for the deportations to end and for UN observers to be allowed into the country. The resolutions adopted as a result of American prompting, which usually received overwhelming support in the General Assembly in those days, had no effect at all on the actual course of events, as they were not backed by any means to enforce them. It is unlikely that the originators themselves actually believed for a moment that the Soviet troops would yield to UN demands and leave Hungary on the one hand, or that Kádár’s government would restore power to Imre Nagy on the other. Still, from the United States’ perspective, keeping the Hungarian problem on the agenda was far from being an empty gesture: the American administration wanted to exert moral and political pressure on both the Soviets and the Hungarian puppet government, somewhat obscuring the yawning gap that existed between the rhetoric of liberation it had used in the early days of the Cold War and the room for maneuver that it actually disposed of in foreign politics. The US was able to check the further expansion of Soviet influence in the geopolitical arena, and most notably in the Third World. And finally, as a result of these resolutions international recognition of the Kádár government was delayed and Hungary’s UN membership suspended for years to come. Nevertheless, it was precisely the relentless disregard for the UN resolutions that finally induced the General Assembly to establish a Special Committee to study the Hungarian problem on January 10, 1957. We can divide the activities of the Special Committee into two distinct periods. In the first, which ran from January through June 1957, the Committee completed a report explaining the causes that had led to the outbreak of the revolution and outlining the events that had actually taken place, as well as describing the Soviet Union’s military intervention and the process by which the Kádár government took over the country. At a session on September 14, 1957 the General Assembly approved the Report with a large majority and immediately passed a resolution on enforcing the recommendations included in the report. The Committee was not dissolved; it was then instructed to monitor political developments in Hungary as well as the two states’ compliance with the earlier resolutions. It paid special attention to the curtailment of political rights, to retaliation and to political prosecutions. The trial of Imre Nagy and his associates, as well as the news of the execution of the Prime Minister and two of his associates, added a dramatic twist to the events in June 1958. The Special Committee issued a statement of protest against the executions. After that, it presented to the General Assembly a second, complementary report, which reviewed the period of retaliation which followed the crushing of the Revolution. The UN put the report, and thus the Hungarian problem, back on its agenda for its Autumn session in 1958. In a resolution adopted on December 14, 1958, the international body accepted the Committee’s second report, once again censoring Hungary and the Soviet Union for ignoring the UN resolutions, as well as for the political terror that was continuing in Hungary, the violation of human liberties and the execution of Imre Nagy and his associates. However, the adoption of the resolution also marked the end of the Special Committee’s work, at least in the form in which it had originally been conceived in January 1957. There were several contributing factors in this decision. First and foremost, after Stalin’s death in 1953, both leading powers in the Cold War confrontation felt – for various political reasons, foreign as well as domestic – that it would be in their own interests to ease the tense relations that had developed during the Cold War. While this process of thaw, which moved ahead at a snail’s pace, certainly had a number of setbacks, such as the crushing of the 1956 Revolution or the execution of Imre Nagy and his associates, the process itself never came to a complete halt. However, the continuing efforts to keep the Hungarian question on the agenda worked against the process of the thaw. By the end of 1958 it had also became clear that the “Hungarian problem” was losing importance in international diplomacy. After the execution of Imre Nagy and his associates, it became perfectly clear that any hopes of restoring the conditions that had existed in Hungary prior to November 4, 1956 were based on a complete fallacy. A contributing factor in this “disintegration of hopes” was the fact that the Soviets were able to persuade more and more countries – either through political pressure or by means of economic diplomacy – to disassociate themselves from the majority that firmly condemned the Soviet intervention. In the Autumn of 1958 Ceylon, in return for an economic assistance package promised by the Soviets, withdrew its representative from the Committee of Five, thus rendering it dysfunctional. Under these circumstances the UN General Assembly passed another resolution in December 1958, in which – while upholding all the judgments and demands specified in earlier resolutions – it declared the Special Committee’s work to have been successfully completed. This, however, did not mean that the Hungarian problem was automatically taken off the agenda. The General Assembly appointed Sir Leslie Munro, New Zealand’s UN Ambassador, who had been among the most vehement critics of the Soviet Union’s intervention in Hungary, as “special representative of the United Nations” for the Hungarian question, entrusting him with the task of keeping a watchful eye on further developments in Hungary, admittedly with a much more limited mandate than the Committee’s. The two superpowers continued to make tentative steps towards a thaw in relations throughout 1959. In this game the “Hungarian question” continued to be one, albeit increasingly ineffective, trump card in the hands of US diplomacy. The gradual consolidation of the Kádár regime – the first partial amnesty in Hungary was announced in 1960 – seemed to be a clear indication that it was only a matter of time before the lid was closed on the Hungarian question. In several of his reports published over the next two years, Sir Leslie observed that the Soviet and the Hungarian governments continued to ignore the existing UN resolutions. Meanwhile, the number of countries standing by the Hungarian cause continued to decline in the General Assembly, which was faithfully reflected by the changes in the voting figures. Also, flying in the face of the Munro reports, there were negotiations going on in the background about the conditions under which the Kádár regime could regain full membership in the international community and the world organization. By the end of 1962 a tacit agreement began to emerge whereby the Hungarian regime – at least in the diplomatic sense – might be given absolution in return for a full amnesty and the freeing of political prisoners sent to jail after the Revolution. Under the aegis of this agreement, and following an American initiative, the UN General Assembly passed another resolution on December 20, 1962, effectively abandoning the Hungarian question. The wording of the resolution would not have been out of character in an oracle uttered by one of the priests of Dodona: on the one hand it expressed dissatisfaction over the failure of the governments of the Soviet Union and Hungary to cooperate with the UN representatives and reiterated the goals of all the earlier resolutions censuring the two governments (the restoration of national self-determination, free elections, the withdrawal of Soviet troops, etc. ), while on the other hand it revoked Sir Leslie’s mandate (after fully appreciating his work) and asked the UN Secretary-General to “initiate whatever measures he deemed helpful in the Hungarian problem.” In this concealed way, the General Assembly empowered Secretary-General U Thant to remove, once and for all, the Hungarian question from the UN agenda in full compliance with the background agreement. The resolution sailed through the General Assembly with 50 delegates voting in favor of it, 13 voting against and 40 abstaining. On March 21, 1963 János Kádár announced a general amnesty, which, contrary to what he had promised, did not result in the release of every prisoner convicted for 1956. Hundreds of prisoners remained behind bars for their so-called “aggravated crimes”. But nobody wanted to make a big deal out of it any more. The brief account presented above should make it evident that the Committee of Five carried out its work in a controversial environment. With hindsight it is difficult to avoid the impression that the Committee was merely a pawn in the big chess game and power politics between the two superpowers. Nevertheless, this circumstance did not seem to affect the Committee’s work or the final documents it produced. From the documents and the published reports it seems clear that under the circumstances the Committee took its task very seriously and performed its job conscientiously and at a high standard. Despite the occasional factual mistakes made in the report published in the summer of 1957 – Imre Nagy was at no time a prisoner of the State Security Police during the Revolution; János Kádár did not show up in the Parliament on November 2 and never conducted negotiations with representatives of the revolutionary committees, as he had already arrived in Moscow by that time – the Committee’s report provides a surprisingly accurate and detailed historical account of the events of the 1956 Revolution. Although their work had almost no effect on the power politics of the superpowers, their report, which was published in several world languages as well as in numerous Hungarian editions, thanks to the Hungarian émigré press, provided an invaluable service to the international community by informing public opinion throughout the democratic world. This was the first detailed and authentic summary of what had really happened in Hungary in 1956. The Committee’s achievements seem especially impressive in the light of the fact that its members had less than six months to produce their first report and had no access to any authentic source of information inside Hungary. On numerous occasions the Committee requested the Kádár government to give permission for its representatives to enter the country in order to conduct inquiries, as demanded by the existing UN resolutions. They also sought permission to make contact with Imre Nagy and other leading politicians of the Revolution (by that time Imre Nagy’s group had been deported to Romania). Naturally, both the Hungarian and the Romanian government rejected these requests. Therefore, the Committee had to make do with public documents released during the Revolution (press materials, political declarations, statements) and information received by various countries through diplomatic or other channels and handed over to the Committee (in this regard, the most willing partners were the British, Dutch, Italian, French and American governments), along with the official Hungarian communiqués published after the suppression of the Revolution and the eyewitness accounts of people participating in the Revolution and forced into emigration afterwards. The international organizations of trade unions that were in close contact with the Hungarian worker's councils during and after the revolution also provided information and sources on the Hungarian situation abundantly. During the same period, the International Court of Justice in The Hague also conducted an investigation into the events of the 1956 Revolution. The results of that inquiry were presented to the Special Committee at the Geneva hearing of Hartley William Shawcross, who was a member of the Court. The Committee’s work was helped by a small staff made up of experts on the Soviet Union and Central Europe, interpreters and emigrant Hungarian experts who were familiar with the local conditions. They collected the material, translated the written sources, eyewitness account and analyses, prepared background material for the reports and drafted the text and the structure of the final documents. The drafts and the proposed reports were discussed at various levels, until the Committee as a whole finally approved the final version and presented it to the General Assembly. The documents preserved by Claire de Héderváry offer a glimpse into the minute details of this process. 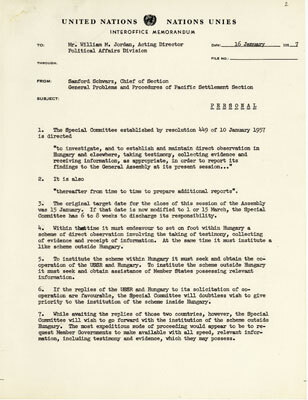 Parallel with the collection of the sources and the analysis of the materials, the Committee set out to interview witnesses as early as March, 1957. Based on various criteria – the most important being that anyone who had left the country before October 23, 1956 was disqualified – they selected 111 Hungarian witnesses. The three prominent political actors of the Hungarian Revolution – Anna Kéthly, a social-democrat cabinet minister in the Imre Nagy government, Béla Király, Commander in Chief of the National Guard and József Kővágó, the mayor of Budapest who was a member of the Small Holders’ Party – were interviewed in a public hearing, while the rest of the interviews took place behind closed doors. As Béla Király later recalled, the questions of most of the Committee members revealed their friendly disposition and feeling of solidarity towards the Hungarian cause. The only exception in this regard was Ceylon’s representative, who tried to corner the witnesses through aggressive cross-examination. Later on Ambassador Gunewardene told Király that the Ceylon representative was merely acting as the devil’s advocate, in order to make sure that the interviews and the report would seem as unbiased and as authentic as possible. All in all, the Committee interviewed 111 witnesses at various hearings in New York, Rome, Vienna, Geneva and London. Eighty-one of them gave evidence without their names at their own request, so as to protect relatives still residing in Hungary from possible retaliation. Once the Committee’s mandate ended, the Soviets demanded to see the list of witnesses. Bang-Jensen, the chief secretary of the Committee, refused to oblige. In the eyes of many, this incident, together with the accompanying harassment, may have played a role in the mysterious death of the Danish diplomat, who is thought by some observers to have been the victim of a political assassination. The Committee made its report on the Hungarian Revolution available to the General Assembly in July 1957. In fact, the report was a rather detailed historical account, which tried to present the findings of the Committee in the framework of international law, making political proposals accordingly. In the interest of greater objectivity, the report dedicated a separate chapter to both the official Soviet account of the 1956 events and the Kádár regime’s own assessment of the Revolution, refuting their versions of the events item by item. In this sense, the report can be regarded as the precursor of The Truth about the Nagy Affair, a book published by émigré circles after the execution of Imre Nagy and his associates. The report regarded the Soviet intervention as a case of external military aggression against the legitimate Hungarian government, an act that was in clear violation of both the UN Charter and international law founded on the sovereignty of states. It concluded that instead of a rebellion sparked off as a result of an organized conspiracy, 1956 was “an instinctive national uprising”, brought about by the nation’s long-harbored grievances. The goal of the uprising was to restore national sovereignty and democratic human freedoms. From the very beginning, the uprising was led by students, workers, soldiers and intellectuals, rather than by the so-called “reactionary circles” and western imperialists. The Revolution was victorious, the Imre Nagy government enjoyed the trust of the people, and there was every chance of normalizing the situation. In a resolution passed on September 14, 1957, the UN General Assembly approved the assessment and proposals of the Committee. In the next stage of the work, when it turned to analyzing the period following the crushing of the Revolution, the Committee could no longer rely on eyewitness accounts, while the collection and analysis of Hungarian and foreign news reports and articles continued unabated. As a result, it was able to document and to reconstruct the process of retaliation that went on after the Revolution, in order to prove that the Soviet invaders and the puppet regime under Kádár were guilty of continuous and severe violations of human rights and civil liberties. They published their concluding statement in the summer of 1958. After that the Commission’s mandate was terminated and its mission was taken over by Sir Leslie Munro, who continued the work right up to December 1962, when the Hungarian problem was last discussed at the General Assembly of the United Nations. In 1981 Claire de Héderváry retired from her position as one of the directors of the United Nations’ Department of Political Affairs, although she continued to receive assignments from both the UN and the Belgian government even as late as the 1990s: between 1990 and 1992 she was the Secretary-General’s special envoy to Japan, and for four years before that she had been a UN delegate representing the Belgian government. In 1950, straight out of Harvard and Columbia where she had studied economics, she found employment at the United Nations, working for the department specializing in technical assistance to developing countries in the Middle East. As soon as the decision was made to set up a UN Special Committee to inquire into the Hungarian problem in 1957, Claire de Héderváry, of Belgian-Hungarian descent, offered her services to the Secretariat assigned to the Committee. During the four years that the Committee was in operation, Claire took part in all the major phases of the work. Her tasks included the collection and analysis of information related to the Hungarian situation, and the evaluation of sources. She was an interpreter during the witnesses' hearings and the preliminary screening of possible witnesses, and participated in the preparation of the various chapters of the Report to be submitted to the UN General Assembly. 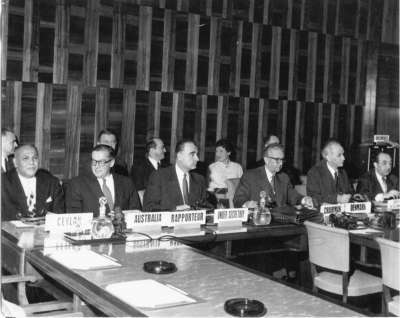 The UN extended the Special Committee’s mandate beyond 1957, appointing a Special Envoy in the person of Sir Leslie Munro, whose tasks were to continue monitoring the Hungarian situation and to lend support to the Committee’s work until 1962. In her capacity as Sir Leslie’s advisor, Claire de Héderváry contributed to the efforts to keep the Hungarian question on the UN’s agenda. According to the UN’s records retention schedule, the documentation of the Special Committee should have been destroyed after three years, and the same fate would have been in store for the drafts produced in preparing the reports, the audio recordings of the witnesses’ hearings, the background material gathered, and even the secondary copies of the official UN documents. Since Claire de Héderváry continued her career at the UN after 1962, she had the opportunity to rescue a considerable portion of the documents and audio recordings, which would otherwise have been destroyed. Upon her retirement in 1981, she procured her boss’s permission to remove the collection, which filled 22 whiskey cases, from the UN. After her New York flat, where she initially stored the collection, she deposited it at the Hoover Institution of Stanford University in California for security reasons. In 1998, following Hungary’s transition to democracy, Claire de Héderváry decided to donate the collection to the Manuscript Department of the National Széchényi Library (the OSA Archives was able to provide financial assistance in bringing the documents home), because she felt that this invaluable collection belonged to the Hungarian nation. The list of documents was compiled by the historian Mihály Zichy, who works for the Manuscript Department at Széchényi Library. Parallel with this, the Library digitized the 77 hours of audio recordings, tapes and discs, for preservation purposes. The work of archiving became a matter of urgency as the condition of the written documents began to deteriorate rapidly and the preparation of the English language catalogue required a broader cooperation. It has also been proposed that the digitized version of the complete collection be published online on the OSA Archives’ web site, as part of the 1956 Digital Archives. From 2008 through 2009 the OSA completed the digitization of the 30,000 pages of written documents and in the current phase of the archiving the online collection is gradually becoming available. In the first stage, the public will have access to the English-language (or occasionally French) transcripts of the 111 witness hearings, along with the summaries of the accompanying tapes, held by the Special Committee. The material to be published online at the next stage will contain the Report submitted to the UN General Assembly, along with the various drafts and including the Committee’s correspondence with the governments, diplomatic bodies and non-governmental organizations. The international and Hungarian press summaries, reports and clippings, which constituted the background material for the Committee’s work, will be published online at a later stage, although they are already accessible to researchers in the Manuscript Department of Széchényi Library and the Research Room of OSA.